The Edulab range of Laboratory Trolleys has been designed for a multitude of applications. 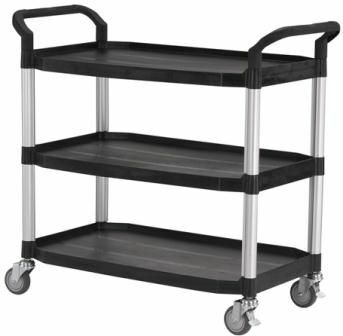 These trolleys are chemical resistant and are used in research, medical, industrial and education labs all over the world. All trolleys are extremely lightweight, have a safe working load of 250kg and are supplied with precision bearing castors including 2 brakes. The Edulab Lab trolleys are ergonomic in design and attractive in appearance. The construction of the trolleys is from the highest quality, nylon fibre blended polymers which are resistant to the harshest working conditions. The Lab trolley also includes a rubber construction mallet for easy assembly. Just a quick email to say that I received the trolleys today. They’re a great job …. I am delighted with them!